Drum Corps International took over Stanford Stadium once again on Saturday night for the DCI West Championship. Thousands of fans filled the college stadium to watch 10 powerful corps compete in California's largest show of the summer. The Blue Devils (83.300) won tonight's World Class competition, with another solid performance of the corps' show, "Constantly Risking Absurdity." The spinning bass drums, tight-rope-walking horn players and members sprinting across the field throughout the show, have helped them stay undefeated this season so far. And Blue Devils executive director, David Gibbs says they are just getting started. "Tonight's performance was good, and we're pleased. The show is probably about 60 percent done and we're going to add a lot. There are a lot of things that we need to improve, so the show will constantly be evolving." Phantom Regiment (81.600) came in second place with its show, "Spartacus," which tells the story of a slave who leads a revolt against the Roman army. The corps beat out the third place Santa Clara Vanguard (80.150) and is widening a gap between them even after SCV edged the Rockford, Ill. corps for top honors earlier this week in Glendale, Ariz. "Tonight's show went really well. We felt very good about it," said Phantom Regiment drum major, Will Pitts. "It was a lot fun to perform in front of a really great crowd tonight." 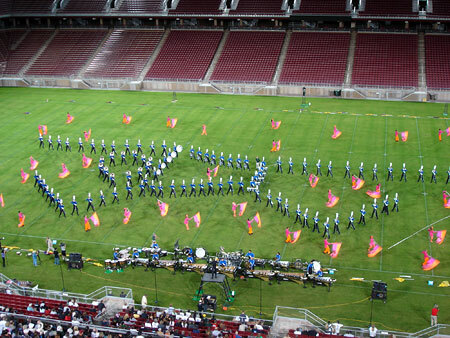 The Stanford competition was also the first time the Vanguard has performed its entire show "3HREE" on the field and the debut of the corps' new uniforms. Vanguard CEO, Jeff Fiedler says that Saturday's performance was good, but the corps has a lot of work to do. "Tonight's show was the first draft. I'm sure there will be some modifications and improvements that we'll make, and we will continue to enhance the show in many places." Pacific Crest (72.750) members earned a fourth place finish in the World Class with a strong performance of their show "Primalty: The Rituals of Passion." The Academy (68.800) finished in fifth place with its program "Vienna Nights," and the Mandarins (67.650) ended the night in sixth place with the show "The River," which explores different aspects of the world's waterways. Blue Devils B (72.150) won top honors in the Open Class, beating out the second place Vanguard Cadets (70.800) with its show "Flight." Long Beach, Calif.'s Mystikal (57.300) came in third place and Blue Devils C (49.900) finished in fourth. Tonight's World Class corps are now scheduled to pack their bags and load their buses to start heading out to the Midwest where they will compete in the Drum Corps International World Championships in Indiana less than a month from today. But as Fiedler says, the season is far from over. "We still have a few things up our sleeve and those will be coming in the next couple of weeks, so you'll have to wait and see what happens."